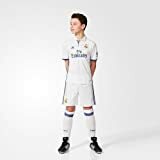 Never miss an opportunity to show your adoration for the current Champions League winners by taking to the field in these Real Madrid 2016/17 Home Replica Football Shorts, made by adidas.These official home shorts of Spanish La Liga giants Real Madrid bear the Crystal White and Raw Purple colour design of the 2016/2017 season and includes three classic stripes on the side and the iconic embroidered club badge. An elasticated waist with interior drawstrings provide a secure and comfortable fit.Made from 100% recycled polyester, these shorts feature adidas ClimaCool technology within the fabric to help keep the wearer feeling cooler, drier and more refreshed by wicking sweat away from the skin during the heat of the action and quickly drying off. Ventilation underneath the legs also enhance this cooling effect.Ready for action in casual matches or training, prove your loyalty to one of the world’s biggest football clubs by adding these Real Madrid 2016/17 Home Replica Football Shorts to your kit bag.